Deep breathing slows the heart rate, regulates blood pressure, dissipates muscular tension and restores mental and emotional equanimity. It also cleanses the body and makes exercising more effective. Rest one palm on your chest, the other on your abdomen. Close your eyes and watch what happens as you breathe normally. Which hand moves? If it is the upper hand you are breathing shallowly, restricting the flow of rejuvenating oxygen. On your next inhalation imagine the breath dropping into the bottom hand, bypassing your chest. Feel your belly swell with the in-breath and draw back slightly with each out-breath. Sit upright, either on a chair or cross-legged, with hands resting palm upward on your thighs, elbows and shoulders relaxed. Watch your breathing. Placing the tips of your right thumb and fingers together, take a breath in through your nose. At the same time imagine a flow of energy moving in through your left hand and up the left side of your body. Open your right hand and close the left hand, breathing out. Feel energy sweeping down the right side of your body and out through the hand. Now breathe in through the right side, close the right hand, open the left hand, and breathe out. Repeat, alternating hands. Sit quietly with your eyes closed. Breathe into the bottom third of the lungs, then stop. Now breathe into the middle part of the lungs, widening the ribs, then stop. Finally, fill the top part of the lungs. Breathe out in a slow, controlled way, from the top down. Pilates teachers encourage full use of the lungs by asking you to imagine the rib cage expanding sideways as you inhale. Place your palms on your ribs, fingers facing forward. Inhaling, feel your rib cage expand to the side. 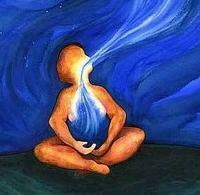 Exhaling, feel the ribs contract. Swivel your hands so your fingers lie over your back ribs. Breathing in, feel these expand, then contract as you exhale. Remove your hands and repeat, picturing the ribs widening at front and back. Sit with your buttocks resting on your heels. Keeping your weight anchored in your buttocks, bend forward gradually, so that your chest rests on your thighs, forehead on the floor, and arms by your sides, hands resting by your toes. Breathing in, feel your lower back and ribs expand. Notice the contraction on the out-breath. Repeat for 3 minutes. If it helps you to focus in any of the breathing exercises, count as you breathe in and out, choosing a number, such as three or four, that you can complete easily, without gasping for breath. Aerobic exercise that challenges the heart and lungs by using large numbers of muscle groups continually for at least 20 minutes improves the functioning of these vital organs even if you�re in your 60s and have never exercised before, according to a US study into aging. Take heart from remarkable studies showing that people aged 85 could improve their aerobic capacity by as much as 20 percent by following a 12�16 week program of exercise in which the heart rate reached more than 75 percent of its maximum aerobic capacity. For optimum results, aim for an hour�s exercise a day: women in their 70s who did so in a study at a US university demonstrated aerobic abilities of women 30 years younger.